Plot Summary: Alice Seno is a 16-year-old girl who has always been overshadowed by her older sister, Mayura Seno. 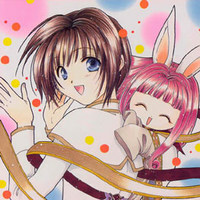 One day, Alice finds a rabbit who gives her powers because she is chosen to be a "Lotis Master". Alice has an argument with Mayura, and the latter disappears. Alice tries to save her, but it is too late. She must save Mayura from the demon that took her and bring her back to the real world.